Cupcakes 'n Daisies: I Made a Bag! Homemade bags have been around for ages, and have seemed to really gain in popularity in the last few years, but for some reason I just never saw a bag that I would make, then actually carry. I guess I was just needing the right bag. And I found it. This bag pattern is in the Fall edition of Quilts and More, it's available right now wherever you buy your quilty magazines. This bag was designed by Carrie Nelson and she was offering kits for this bag on her online shop, so I ordered one. The kit came with fabric for the outside and inside and the cute polka dot handles. The first order of business, piecing the front and back. And that was a breeze, piecing is what I do. For my batting I used Soft and Stable, because I wanted my bag to stand up and look neat, not slouch down in a hump. This stuff is great, I could not recommend it more highly. It was easy to work with and gave my bag the exact look I wanted. Next up was the quilting, that's not what I do. I played around with some stitches on my machine and the blue marking pen I sometimes notice other real quilters use. In the end I just went with a straight stitch, in the ditch from left to right, and every 1/4" top to bottom. I had not quilted anything since I made my 3 Countdown to Christmas pillows. It seemed like it took forever to quilt those two pieces of fabric. I think it took at least 2 hours per side. But I love the look, that might be my favorite thing about the bag, the quilting! Rookie mistake, what else can I say? Every now and then I would draw a line down the back of the piece to make sure I wasn't getting off track on my vertical lines. I would use the horizontal lines as my guide to line up my vertical lines. I checked it about every 8 to 10 stitches. The directions for this pattern were wonderful and easy to follow. Here's the bottom of my bag. In one try! I was thrilled with how it all came together, and looked neat, not sloppy. Here's the inside of the bag, all pieced. Here's the inside of the bag with the lining. My lining is a little big, I maybe trimmed off more of the outside of the bag after it was quilted and squared up, so that's on me. But I've bought purses with worse lining than this and I'm OK with it. After all, this is my first bag, and I think there's a learning curve with this type of project. I didn't want my bag to have a saggy bottom so I added some support. I just took the front cover off an old political book that had been on my bookshelf for over 20 years. I picked this book because it was the right size and had a very substantial cover. I just made a little case and slid it in. So here's my finished bag, a bag I love and can hardly wait to carry. I don't make little side projects like this very often, I've made a sewing machine cover and 3 pillow covers and that's about it, so I'm very proud of myself for trying something new, and thrilled that the end result doesn't have that look that screams, "look at me, I'm homemade". I've never read a bag pattern before this one, maybe they are all the same, but this pattern was very easy for a beginner to follow and has some nice details that make the bag look stylish, like the stitching around the top and how the lining is a good inch below the outer print inside the bag. Believe me, if you've been too scared to try to make a bag try this pattern, I had no troubles at all. This is Lifetime Bag Number 1! It finished at 13 inches top to bottom, 12 inches wide at the base, and 17 inches wide at the top. There are approximately 80 pieces, counting the handles. After making 114 quilts I'm amazed by how proud I am of myself over this silly little bag, but I just love it and I will use it. I love it so much that I want you to have one too. The kits that were available when the magazine first came out have all been sold, except for one. I bought one of the last ones for a giveaway. So if you are like me, and never thought you could or would make a bag, or even if you are a real bag lady with a dozen bags but need one more, leave a comment on today's post for a chance to win a kit. You will need to supply the batting and some backing for the pieced sides. 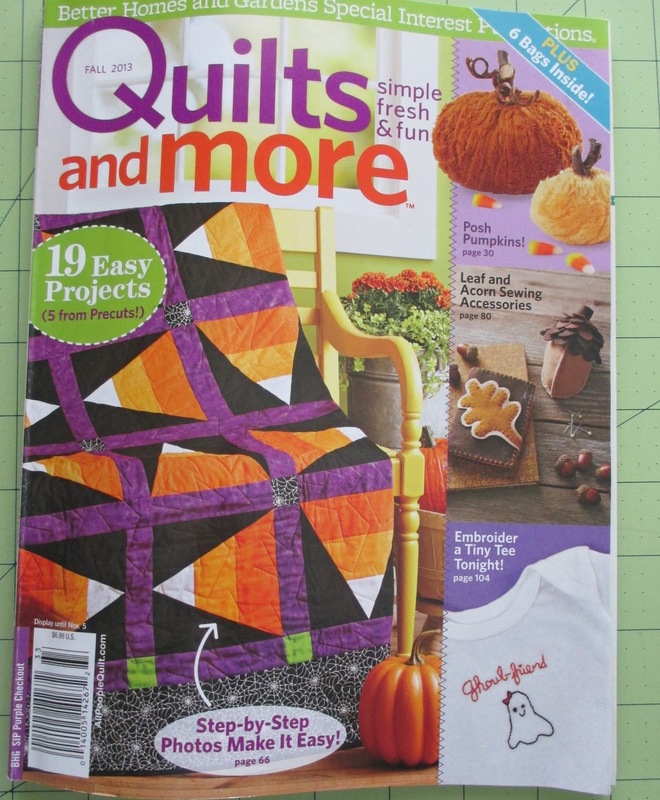 The kit does not come with the pattern, but Carrie has volunteered to supply a magazine with this kit. Thanks Carrie, I'm glad I don't have to give mine away, I may make another one! Leave a comment on this post by the end of day Saturday, September 14th. If the USPS will deliver to your address you are eligible to enter. I will announce the winner on Sunday, please leave a way that I can contact you in your comment. In your comment I would like to hear about the favorite thing you did or made this summer. I went to Paris and I made a bag, I had a great summer! Giveaway now closed, thank you for stopping by. It turned out beautifully. I would love a chance to win! I would love to make this bag. The handles are so cute! Like you I have never made a bag, but this one is too cute! Thanks for a chance to win a kit. I LOVE that bag! It turned out wonderfully! Those pops of red and polka dot handles just make it! Thanks for the chance to win a kit. Your bag is very cute. Congrats on working a little outside your comfort zone. If only we would all be so brave! Very cute bag. Love the fabrics. What a cute bag! Thanks for the chance to win! I went to Cape Cod this summer and just finished a t-shirt quilt for my nephew! Yay! Your bag turned out great! I love the fabric and the handles are too cute for words. Thanks for showing us some pic's along the way and for a chance at winning the pattern and kit. Isn't it nice when a new adventure turns out sew well. It doesn't take a lot to make us quilters happy. I haven't "finished" anything this summer but have been diligently working on little 2" bow ties. Would love to win the kit. Thanks for the opportunity to win! I would love to win the bag kit. While reading your post I decided to order a kit...but I guess not! Darn. Your foresight in ordering a give-a-way kit might just be my good fortune. My favorite summer project was finishing Bonnie Hunter's Easy Street. I just posted it on my blog. Love this bag! I have never made one either, but this one might be it! This summer I worked on several quilts... I don't work in the summer so it's always a perfect time to catch up! This is really a wonderful bag. LOVE IT. And I would be so happy to win the kit to make one for myself to. Soon going for a visit to USA and I need a new bag. The favorite thing I have made this summer has to be a little coinepurse. But perhaps my favorite sewing this summer has to be the hexagon flowers I started to sew for a new quilt. Still has a lot to do on this quilt. Your bag is wonderful! I'm a bag lady, myself, and would love to win the kit to make one like yours. Late this summer I finally got started on string blocks and made two baby quilts (well, flimsies at this point) for a charity that serves underresourced new moms. I am pretty pleased with these . . . . I've never tried making a bag for the same reasons as you, but you've inspired me! This summer I went back to work after being on medical leave for four months, started quilting again!, and am learning to crochet. What a darling bag. I'd love to win the kit. This is the kind of thing I miss just because I have imposed a 'don't buy any more magazines' rule on myself. Really nice bag Thelma and sounds like an easy one to do.....That quilting is just right for that bag. Who wouldn't want one for themselves. I have the magazine and saw the project, was debating whether to buy a kit. I think the choice of fabric and the handles really make a good, usable look. I see many bags in magazines and on blogs, they look great but I know I would not use it, I am too attached to my leather purses. But I like this one and could myself using it. My favorite thing I made this summer was my Lemoyne star quilt. It is still being quilted so not quite done, but close enough. You're right, that is the cutest bag I've seen. One I would use and love to make. Thanks for the giveaway and love your blog. The bag is lovely! Congratulations on your finish. What do you plan to use it for? Shopping bag? Craft bag? Everyday bag? My BFF and I took our granddaughters to the beach this summer and I've made some table toppers. All in all, a good summer! I would love to make this tote. It looks nice and roomy! No time for quilting this summer but lot of family, cooking & washing...Very beautiful bag, Thelma. Would love the bag kit---cute, cute, cute! That is an adorable bag! I would love to make it. My summer was spent with my grandkids. The oldest is now in school and I knew that there would be limited time this winter to spend with him for the rest of his school life (which made this grandma very sad) so every chance I had he and his brother and sister were at our farm, we had a wonderful summer. I also managed to finish several quilts, my favorite is my Blessings of Spring quilt, it is a pieced and applique quilt, it's not quilted yet, but when winter comes I'll get it done. Thanks for the give away! i have to confess, i am a bag lady ... not a purse lady (i buy one purse every five years or so, and make it last waaaay past shaggy), a BAG lady ... and i hope that no one else enters because i love the Road 15 fabric, too ... i know, i know - it's all about ME!!! I love Carrie's patterns...so simple and yet stunning! Great job! I love the bag and already have the magazine. I would love to win the kit. It's been a rough summer at my house so the most exciting thing I have done is go to grand kids ball games. They are such a joy to watch. The only sewing I have been doing is putting on bindings. Your bag turned out beautiful! Thanks for the tip about the soft and stable product. I've made a few large bags in the past using fusible fleece and they end up as saggy bags. I love the Road 15 fabric line and would be thrilled to win this kit. Thanks for the opportunity. I have made a couple of bags and I'd love to make this one, too. My summer went by way to fast! The best part was having my daughter and granddaughter visit for 3 weeks. We had a great time! Thanks for the giveaway. Wow, what a great bag and you did a beautiful job on making it---well done! My summer was not filled with any real excitement. Due to my husband's work-related broken arm, we were unable to vacation. However, in between his care & appointments I was able to do a little sewing! I was the most proud of learning to make an authentic boys bow tie! I'm am just giddy with the results---all over a tiny bow tie!!!! Your bag is lovely, and I'd rather have a too large lining, than one that is too small! I've never made a bag (well not since high school--just a few too many decades ago), but you make it look easy! Your bag is so cute. What a great giveaway. Thanks for the chance. we had lots of great family times this summer including a wedding which was grand. I love this bag and I think, after your blog post, that I just might be able to make it!!! I spent a week at the beach with our children and grandchildren....26 of us, Wonderful!!!! With all the beautiful quilts I can't believe this is your first bag.:). Cute bag! I know I don't NEED another bag but it sure would be fun to make:). Thanks for the give away! The bag looks great, but not at all surprising...designed by Carrie, made by you! I've bought a bag pattern from Green Fairy, but I haven't made it yet. Do you have an apron on your to do list?? And my favorite thing from my summer was getting our driveway put in! Great job! I make a lot of bags, in fact my husband shakes his head now...how many bags do you need? Never too many is my answer! I would love a chance to win this kit! Either way, I will be making it. Thanks for the detailed pictures of your bag project and the recommendation for Soft and Stable. I'd heard about this product and now, I just might use it in a bag. Your bag looks great!! This summer I focused on finishing some UFOs--one had been in "progress" for 6 years, I'm sad to say. But I still loved the fabrics. We moved from California to Washington state this summer. My granddaughter came to visit for a week. It was a delightful time!! SO! 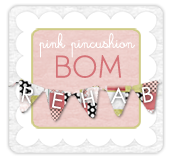 It was you that got the last Carrie Bag kit!! I was a day late/dollar short (or something like that) when I tried to get the kit for one of the cutest bags ever! I am not a bag person either, but love this one! And yours looks great for not being a bag maker. Thanks so much for the chance! oh I LOVE< LOVE>LOVE> this bag! not only is it the pattern, perfect fabric choices...that added red in there makes it for me and of course polka dot handles just make me smile. congrats on finishing yours, enjoy using it. thanks for an amazing giveaway. This summer I visited the American Museum in Bath, UK which was lovely! Lovely bag. I would love to make one. This summer I got three kids ready for college.Almost an empty nester. A bag would be a nice treat for this time of life when i am missing my kids. I made 2 Schnibbles and spent time with family. I love this bag! I loved watching the progress on Instagram. Your bag is brilliant, love the fabric. I worked on the wool and needle handwork bom this summer many days at the "lake" nearby. I've not made many bags but I agree that this is a nice design! 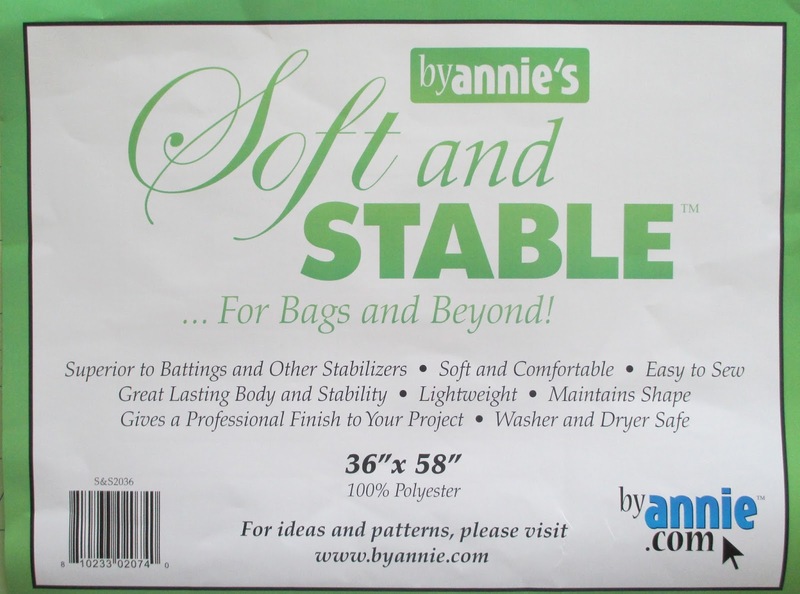 I already have some soft n stable so I'm all ready for a kit to come my way! Thanks for a chance to win! I came soooo close to buying her kit earlier. I have the magazine and loved the colors in the bag as well. I have never made a bag (yet), so I would love the chance to make this one. Please enter me in the giveaway. Thanks Thelma! Love the way your bag turned out and the quilting is perfect! That rookie mistake was made by me a few months ago when I quilted a scrap onto the back of my quilt by accident. Even a "veteran" quilter can make mistakes! Cute, cute bag! I've made two bags in my life, but just recently discovered the Soft & Stable and love it! I made a hexagon quilt(my first, and SO easy) for a niece having her first girl after 4 crazy boys. She deserved it! I would love to win~ Thanks for the giveaway! You did a great job on this bag! Funny how working on something different can make you feel so proud, huh?. It's nice to test new skills. I like the lining you used. I explored the Finger Lakes region of New York with my grandchildren and my non-quilty summer project was adorable owl pillows for my grand daughters. Love your bag! Would love to have one of my own. I have seen that bag and just love it! Great job! Thelma, this is just stinking cute! I wasn't going to enter the give-away, but I'm up for it simply because the handles are darling. Like everything else you make, this bag is a winner. I just love the colors and design in this one. Thanks for the giveaway--I would love a chance to win! This looks awesome! I'm just dipping my toe into bag making - and I'd love to make this one. Thanks so much for the chance to win! Great bag! Would love one to take shopping. Summer has gone by to quickly, lots of gardening not much sewing. Your bag turned out fabulous. I followed along on Instagram and am glad you found it to be so easy. I have not made a bag before and it is on the someday list. I did make several pillows for my daughter when she went back to college a few weeks ago and now she wants me to make some for their living room sofa, guess I done good! Wonderful bag and pretty fabrics (I have the magazine with the pattern - my favorite quilted item completed this summer was a gardening theme lap quilt for my mother's 85th birthday. I would love to win this kit! This summer I went to Alaska on a cruise. First time in Alaska and on a cruise ship. I alo retired and have been enjoying every day. It's great to have the time to sew every afternoon and I've completed 2 3/4 quilts. Wonderful bag! And I so appreciate the tips about the stable bottom and the stiffer batting. This summer I made a "Modern Wedding Ring" quilt out of batiks for my brother and his wife, celebrating their 25th anniversary! It turned out beautiful! I saw your bag on Instagram when I was doing a quick run through and loved it!! I've never made a bag but there's always a first time!! Love the fabrics and the size and shape. You really did a wonderful job for never doing a bag before! I have never made a bag similar to this one, it's really cute! I spent a lot of time with my granddaugther this summer, which made it very special. Thanks! Your bag turned out great - I love the quilting and the polka dot handles. I feel really lucky to have had the opportunity to travel and visit with all of my siblings and all of my nieces / nephew - except for one. This is a big accomplishment because we are spread from coast to coast! Great bag! Isn't it funny how excited we can get over small projects when we are used to the time it takes for a big quilt project. My favorite thing I did this summer was spend three weeks at the beach with different groups of family and friends. I'm still working on a big quilt project that has taken a big chunk of the summer. I hope to have it done by the recipient's wedding in October. Wish me luck. Congrats on your first bag Thelma! I love your enthusiasm for the finished product and hope it enjoys many travels with you. I finished a scrap rug over the summer that I love...as in crazy, illogical, and over-the-top kind of way! Thanks for the chance to win an awesome giveaway! I'm crazy about batting, I call it Annie's but you have the right name. It sure gives body to bag, I've made some baby shoes also with it. Cracked me up to read "lifetime bag #1" though, I must admit!! Love those handles too! I would love to try this bag too - thanks for a chance to win a kit! What a great bag. Like you, I'm not a bag maker. But I can see why you made an exception for this one. And I would, too. Terrific bag. Great fabric. Excellent pattern and seamstress! This summer I had a week in Ireland, which was fabulous. Spent time settling into a new home. No sewing space yet, so I didn't make anything in that sense. But we did make lots of memories with family in our new home. I had a quiet(er) summer... youngest graduated from high school. We had a staycation this year. :O) I am starting to piece again and working on a quilt. I would love to try to make a bag like this -never tried one like this and the handles are so cute! Loved your guided tour - makes me want to make one. Was going to go order until you said they were all sold out! ;O) Thanks for the fun offer! I LOVE your bag! Oh wow-- would love to win and make one for myself! I made a really scrappy quilt out of my twin daughter's baby clothes. I only kept things that were woven and 100% cotton (no knits) and it's so sweet! I pieced, layered, quilted, and bound the whole thing in a matter of months (quilts usually take me a loooooong time to finish). I have a TON of scraps left, so more quilts to come. What a fabulous bag! I have to say I nearly fell off my chair when I saw the title of your blog post. 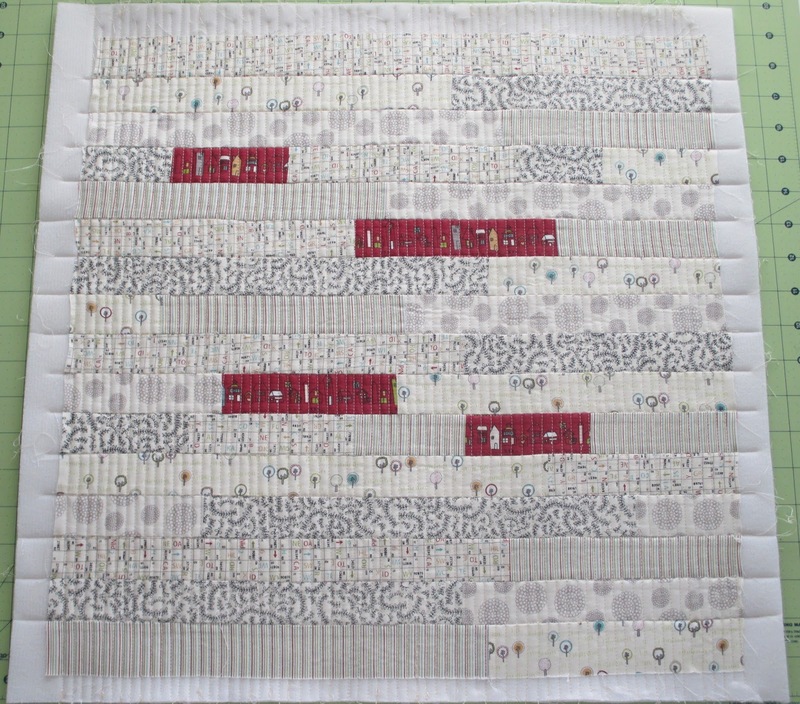 Your quilting is great too! A really lovely make Thelma - you can be justly proud! I LOVE bags and have made several for teacher gifts for my kiddos teachers. However, I've never made this style and would love to have the chance to. Great job on yours! I've made a few bags. I like ones for library books. I like this bag, too and I'm sure I would make it! SO cute!! I've only made one hand bag, and a friend helped me read the pattern (you know what I mean). Anyway this one is so adorable. Yay for Carrie. And Yay for you!! I love the bag and had wished I ordered the kit when I first saw it. My favorite thing I did this summer was go on a week-long trip to New York City with my daughter. We had a great time. My favorite project was a quilt made with one of those twister rulers for my granddaughter's first birthday. I used a layer cake of Butterfly Kisses, an older line from Me and My Sister. Then I pieced the back, including piecing her name into the backing. Great handbag. I have made a big carry bag but not a purse. Would love to win. Thanks for the giveway. I've been thinking about buying (or making ) a bag-so I would love to win this kit. This summer I made a jelly roll quilt to use on my front porch. I used really bright colors so my neighbor could enjoy it too. Now I'm waiting for her to make one for her porch so I can enjoy it ! I've been looking at bag patterns and they all seem so hard. But not this one!!! I would love to win the fabric and pattern to make this bag! This bag is just the type that I usually carry. I like them big so I can put a lot of necessities (junk) in them!! Thanks for the giveaway!!! 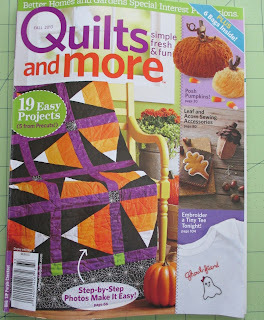 Love the bag, have the magazine with the pattern and would love to make it. Would be wonderful to win the kit. Thanks for the chance to win!! Your bag is outstanding Thelma! 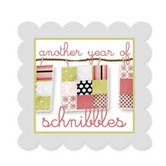 I'm so glad you enjoyed making it :-) I hear the joy in your blog of learning how to make something new! That's one of my favorite things to do. What a feeling of accomplishment :-) It's such a cute bag! I'd love to win one. I have the magazine and I've been thinking about that bag. 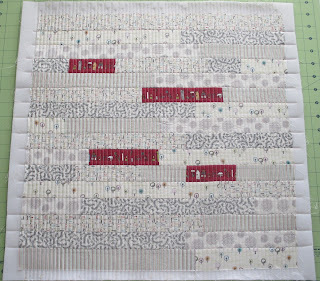 Oh, and your quilting looks nice :-)! Congrats on a bag well done! I have a feeling it is just the first of many. Thanks for the chance to win a kit so I can make one of my own. Fab job on the bag!! I love the structure and simple lines, great job. I had a very busy summer, quilted my first two customer quilts, vacation with family at OBX, made two cute stuffed elephants (pattern from "Retro Mama")and a matching quilt for my nephews first child, and three scrappy quilt tops, wow, I guess I had a productive summer. Love your blog! Love this bag, it's my style, just open and jump your stuff in...thanks for chance to win this super kit..
What a fabulous bag! Like you, I've not seen one that I would like to make....until now! This style is perfect! My favourite thing I did this summer was to re-landscape the front of my house. I know, that's not too exciting but it was fun for me. I took repurposing to the limit. From the backyard & split some hosta & sedum & planted them in the front. I dug out an old cedar bush & laid down cedar bark. I am absolutely thrilled with the result & the money spent was only for the bark. Next year, I shall construct a stone walk way! I can hardly wait. It's been a great summer! Thanks for a chance at the give-away. Hi Thelma -- your bag turned out beautifully! My friend Colleen is making the same bag out of black and white fabrics with a splash of shocking pink. If I'm the lucky winner of the kit, I'll make the bag alongside her. I've been working on various and sundry quilty projects this summer -- finishing up some WIPs but somehow I keep starting new ones too! My summer escaped me! I don't think I touched my sewing machine...but I created memories for the kids with lots of trips to the swimming pool! My favorite thing I did this summer was visit with my niece in Hawaii, she's amazing :) Love your bag and also your photos! Love the bag, you did a wonderful job on it. I have never made a bag before. The handles always look too hard to attach. I'm embarrassed to say I haven't done anything exciting yet this summer. My husband and I are planning a trip to Estes Park CO next week but I just a surgery today for a kidney stone. Hope we can still go. We love the mountains and the cooler weather. I am always amazed at the beautiful quilts you make and especially the way you change a pattern to make it you. You have a wonderful talent. This bag is adorable!! And I would love to make one. This summer my Mom, daughter and myself went on a New England road trip. We started in Boston, MA drove all over Massachusetts, up to New Hampshire (where we visited Keepsake Quilting)and finally to Rhode Island. We had so much fun together and have great memories that will last forever. Love it! My birthday is Saturday! It would be a great gift! I went to my first NFL football game - Rams (fan for over 30 years) at Broncos. We drove 6 hours and I enjoyed it more than I ever thought I would! I love the bag! Normally I make small bags to carry all my essentials inside of my big bag, but find I am in need of a new big bag lately. This would be perfect. This summer I went to a quilt retreat with my friends. I had so much fun and didn't get much sewing accomplished since I was too busy talking, visiting, laughing and eating to do much else. I had a great time. Fingers crossed to win since I never found a copy of the magazine. That is definitely a great bag. Good job, Thelma! I went to my grandaughter's college graduation and finished up several projects. I love the bag. What a great bag, good looking and useful too! And thanks for such a generous giveaway. Thelma, I love this bag and could see myself using it. I, too, have not made a bag. This would challenge my quilting skills. Thanks for the giveaway! Great bag! Thanks for the chance. The bag is great. I tried to order the kit and they were all sold out. You did a great jog. This summer I have been working on UFO's. I have finished the tops of several. It is nice to see them done. Plus I added a few new ones in between Nancy P. nplyman@yahoo.com. My summer was not to great. I did hand quilt all of my small quilts while laying in the couch so that counts for something. I tore the tendon in my foot so was in a cast for almost three months starting May 1 just got out of PT and it still is not right. But the bright side I quilted by hand and made hexi's. I have been reading about your trip to Paris and your journey with the dresdens. That quilt is now on my to do list. Very nice handbag. I've been working on a Halloween quilt this summer. Hope to finish it soon. Lovely bag. The favourite thing I did this summer was go home for holidays with family and attend my sister's wedding while there. Favourite things I sewed were the bridesmaids dresses for the wedding. You did a great job on this bag. It looks so professional!! I had fun remodeling some rooms in my house this summer. Great bag! I have not seen one quite like that before. It has such shape and style! Enjoy! Very cute bag! I would love to make one. If I win the drawing you can contact me by email. offkwilter@gmail.com. My favorite part of summer was visiting Mt. Rainier! I have it on my list of bags to make but like you, I'm a little skittish when it comes to making bags. What a nice bag, I would love to win the kit! My favourite part of the summer was camping with 4 teenagers (our 2 grandkids and their friends). Don't feel bad about your "rookie mistake". I think I do that on EVERY quilt I do! I swear! IT is so annoying! I started pinning the corners together and that helps...until I get to the corners and have to FMQ them! I just did the FMQ on a bargello and sure enough...one of the corners ended this way and I had to pull it all out. I am starting to think I am jinxed...or maybe to be nice, maybe this is the FMQ curse! Love the bag tho, I am working on making bags, butnot to the extent you have...yet! Thanks for the inspiration! Congratulations on a job well done!! It's always a thrill (and a boost to the ego) when a project comes out better than expected. Thank you for this giveaway. I love this bag too. Carrie's patterns are the best. What a great bag! As usual, it's beautifully done. Thanks for the chance. Love your blog! Beautiful! I love making bags. I would love the chance to make this bag for my mom. She doesn't have nearly enough polka dots in her life, and she's been whining about not having any Road 15 fabric. I love your bag! This summer I made my first quilt. Thanks for the chance to win! My favorite thing that we did this Summer was move into our retirement home. :)))) Lots of work, but we love the small town we have relocated to. Lots of wonderful lake views. Great job on your bag! I love the bag, I love the fabric, I love polka dots and I've never seen a bag I really liked well enough that I wanted to make one for myself! I made a Four Patch Posie quilt and a baby quilt this summer. Would love to win, thank you for the opportunity. I don't have a favourite thing that I made. It's all a blur. However, my husband and I did go camping with our children and their significant others. Haven't been camping in years and it was a very nice time. Thanks for the chance to win. Your bag is gorgeous. Love those colours. Thank you so much for the contest! I had a great summer too, I spent a month at my parent's cottage and enjoyed the lake and spending time with family. This left me time for hand work and I finished some bindings, some embroidery and some knitting! I have never made a bag before but you make it look easy and the bag is great. Well done-I love making bags. They are a quick gratifying project! I have been eying this one and with your review of it's ease will be putting this on the "for sure" list! I LOVE your bag - and your quilting totally makes it! I'd love to try one! This summer - my latest venture was starting hexies. So far no defined layout but will keep making them till I decide :) Also this summer it was exciting our youngest graduated high school and we enter the college phase of life with our two sons! Amazing and oh so cute. I 'd like a chance to win also. I have also made that rookie mistake more often on smalls than I would like. Always when I'm in a hurry, and nearing the end of a project.